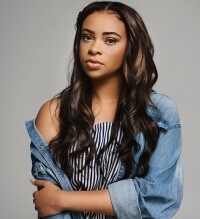 The extraordinary success of Koryn Hawthorne has continued as her single "Won't He Do It" stays at number one on Billboard's Hot Gospel Songs chart for a record breaking 28 weeks. Koryn rose to fame after her appearance on the American singing contest The Voice in 2015; she subsequently switched to gospel and signed with Sony's Provident Label Group and this year saw her first album 'Unstoppable' debut at number one on Billboard's Top Gospel Albums chart. Koryn grew up in Abbeville, Louisiana, and as the daughter of a minister she first began singing at church. Koryn has always been performing, ever since she was a small child. At the age of nine she joined an organisation called Louisiana Kids in which she would compete against other children in her state. It's not surprising that when she was older she would be competing against people from all over America on The Voice. Before The Voice she sang locally at nursing homes, charity events and churches. Koryn auditioned for various reality singing competitions from the X-Factor to American Idol but when her mother said she should audition for The Voice her initial reaction was 'no'. Speaking to CCM magazine website Koryn said, "I said I'm not going because I had just got told no, so I was a little discouraged." She eventually gave in; she auditioned for The Voice when she was 16 and hasn't looked back since. Her opening song on that programme was "How Great Thou Art". She told Atlanta Voice Newspaper, "I grew up watching reality TV singing shows and I did a lot of competitions too so I was definitely prepared for it, I had the mind for it and I knew I had to have great song choices every week. I think even with the conversation with Pharrell on the show, we always wanted to choose something that meant something on the inside and something that I could relate to." Although on The Voice Koryn covered a variety of mainstream pop songs such as Beyoncé's "If I Were A Boy" and Emeli Sande's "My Kind Of Love", she wasn't going to abandon her Christianity or her gospel roots when it came to making her own music. Koryn described the difficulties she faces being a Christian in the music industry to Bethel Music website, "Being a Christian in the music industry is definitely challenging sometimes. Lots of people had their own visions of what it was they thought I should become. I'm so glad that I know who I am as a person and as an artist. I'm proud of myself for staying strong and being able to express my faith on and off the stage." Prior to The Voice she had also auditioned for American Idol but one of the producers said she wouldn't get very far. Koryn told Billboard website, "She was referring to me attempting worship music on the show, and she basically said not to even try, that it would eat me up. She used those exact words." When Pharrell Williams became her mentor on The Voice she said he understood her need to proclaim her faith. She told Arise 360 website, "The very first time we even spoke he was like, 'We have to do gospel', it was incredible that he just saw that in me and was just so open to it." In terms of the gospel music community Koryn is one of the youngest and has a more contemporary sound. Talking to Parle magazine website she said, "I've always been a super versatile person. I love all kinds of music. Even now, I still listen to everything! I think that's just the most important thing for me. I feel like, just because I'm a gospel artist, I don't have to sound like typical gospel would sound." Koryn has admitted that being part of the gospel music community is difficult when you're so young and surrounded by legends. "I think, being a younger artist, it is kind of hard to be taken seriously. I'm just trying to stay true to who I am. I know my journey; I know everything that I've been through." After finishing fourth on The Voice, Koryn appeared on and was involved in a number of other TV shows. In 2016 she guested on the show Mary Mary and met her soon to be producer Warryn Campbell. Later that same year she recorded the song "Saints & Sinners" for the soundtrack of the TV show of the same name. The first song that Koryn put out was a collaboration with Christian artist Branan Murphy on the single "All The Wrong Things" (2017). Later that year, the singer appeared on OWN's TV show Greenleaf on which she debuted the lead single "Won't He Do It", from her debut EP 'Koryn Hawthorne'. Surprisingly Koryn didn't think that the song would go anywhere other than on that episode of Greenleaf but her label decided to release it as a single and it made number one. Speaking of the single she told Arise 360 website, "I know that "Won't He Do It" is my life testimony; I honestly give everything back to him, I trust him with everything." Soulbounce website reviewed her self-titled EP, writing, "With positivity and optimism flowing freely throughout, Hawthorne's first solo outing could be just what you need to make it through some tough times." Koryn told Parle magazine website about what it's like now that she can write her own music. "I love being in the studio, I love writing. That's when you step into your artistry, you know? It's great to be able to perform, but I'm a creator now, because I'm making my own stuff. So, it's a cool process." Koryn teamed up with some well-known songwriters and producers on her EP. The best known are Warren Campbell who has written songs for Jay-Z and Alicia Keys, and the Grammy Award winning Makeba Riddick who is best known for her work with Rihanna. Working with such hitmakers must have worked because its success earned Koryn two Stellar Gospel Music Award nominations. Earlier this year Koryn released her first full length album, 'Unstoppable', which reached number one on the Top Gospel Albums chart. She told CBN News website, "Throughout the course of my life, God has always orchestrated my steps. The purpose that God has over my life is unstoppable and nobody can stop that. With this album, I want to encourage other people with that. Everybody has a purpose and at this time, it's necessary to find out what your purpose is and be unstoppable in it." Not long after the release of her debut album she was also featured on the single released by Aaron Cole, "Down Like That". Koryn told Bethel Music website the advice she would give to other artists who are just starting out: "Make him the number one reason you do what you do and he will work through you." As someone who had the opportunity to go down the route of mainstream pop music or R&B and was told she wouldn't get anywhere singing gospel, it's good to see that God has remained the reason for all she does and the music she makes.